A handwritten "Sold Out" sign taped above the ticket window of the legendary Phoenix Theater in Petaluma, Calif., promised a packed house. 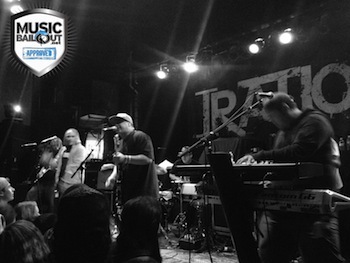 Reggae-rock attraction, Iration, could have easily sold out the 600-capacity venue without The Green joining the ticket, but their addition made a sold-out show a certainty after they maxed out the 1,400 capacity Montbleu in South Lake Tahoe the previous night. The fortunate few who snagged theirs early gripped their stubs tightly as the ticketless unfortunate scoured the sidewalks for spares. Inside, the flaming hot guitar chops of P. Dub's Bryce Klemer were warming up the growing crowd. The Phoenix is famous for being one of the only larger all-ages venues in the North Bay and for being the very last venue that Sublime performed at before Bradley Nowell tragically passed. The sound system isn't the greatest and they don't serve alcohol, but these issues were easily overlooked with a lineup like this one. As I approached the entrance, I could already feel the vibes of Pacific Dub reverberating through the graffiti-laden walls. The Huntington Beach bunch seems like they matured since I last heard them—two years ago at the Blue Sky Festival in Mammoth. As I listened, it took only moments to determine that musical strides have been made. It’s no wonder they are wooing scores of new fans everywhere they go. 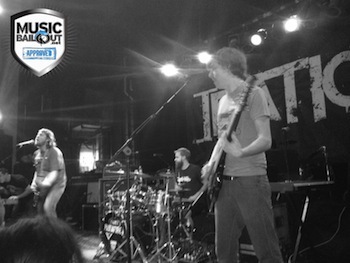 Empty floor space became increasingly hard to find as Passafire out of Savannah, Georgia, took the stage. Bassist Will Kubley's loaded pedal board caught my eye immediately—with such an array of effects at the tip of his toes, he was able to bring some beautiful tones and unique sounds to the forefront of the performance. Their energetic keyboardist, Mike DeGuzman, surprised me when he leaped up from behind his keys onto the speakers to pump up the crowd. And again when he broke out the melodica playing it with the right hand and bubbled the organ with his left, bringing yet another unique sound to the stage. The vocals of Ted Bowne meshed well with Will's high harmonies and Nick Kubley's rhythms helped to keep their performance fresh and engaging. As the technicians reset the stage, fans became serious about claiming space at the front. The anticipation for the two Hawaiian bands yet to perform was palpable. Freshly purchased trucker caps perched--each stylishly tipped--on the heads of their stateside fans. The lights dimmed as The Green took the stage. Cheers and whistles exploded. Shrouded in an orange hoodie, Caleb Keolanui commanded visual attention from the beginning of the set. His laid-back personality translated well when technical issues with his microphone attempted to faze him. Trading off the lead vocals with the two guitarists, JP Kennedy and Zion Thompson, conveyed a natural humility and camaraderie within the group. Their perfectly blended vocal harmonies proved their true unity, making the 6-piece band appear as one man. Sporting the new Nord Electro 4D, keyboardist Ikaika Antone held a solid roots bubble and skank while drummy Jordan Espinoza kept the beat tight with beautifully timed fills and solid rhythms. Though they didn't perform a couple of my personal favorites, their vocal talents always blow me away and their popular song, "Love and Affection" was sung back to them loudly by the crowd. Their departure from the stage was bittersweet. The crowd was sad that they were finished. Their island feel brought the roots reggae fans in the building some tasty tracks to be savored, but everyone was on their toes, ready for Iration to rock. The merchandise booth buzzed with activity as the stage was reset and the headliner's gear was unveiled. Backstage security was tightened - in and out privileges revoked throughout. The house lights faded once again, and the glow of blue filled the stage. A mellow intro dub pumped through the speakers and the theater erupted when the first licks of their title track off their most recent full-length album, "Time Bomb," went off like one. Most fans knew every word, singing the song with along with them. Micah Pueschel didn't even sing the chorus half the time, allowing the Irators (as Iration fans are called) sing it themselves. Bodies were jumping to "Turn Around" and the current charged through the theater during "Electricity." They crushed their most popular songs including their newest single "Porcupine" and a special treat for live audiences only, their version of Weezer's "Say it Aint So." Vocalist and Percussionist Kai Rediske took the lead on a few songs including their popular version of Michael Rose's "Cookie Jar" off Iration's early "No Time for Rest" album. Bassist Adam Taylor actively engaged the crowd. He owned the stage, really reaching his instrument out over the front row, dramatically pausing when the breaks hit and singing along with the choruses. Back in the sound booth, "King" controlled the dub effects, adding some delicious delays to the vocals, snare and timbale. Throughout the set, I found myself waiting to hear the familiar opening line from the song "Falling" off of their "Sample This" EP. But they left the stage, leaving me hanging. Fortunately, the foot stomping brought them back out and they satisfied my craving with an encore. Everyone joined in singing, "We met at a concert. You were wearing Converse. I'm not good at playing it cool." Keep a close eye on Pacific Dub. They are gaining some impressive momentum and are rising quickly through the ranks of "dubrock" reggae. Passafire is gaining popularity across the nation as well. Any of their upcoming dates along the East Coast, Texas and Arizona in March & April are shows not to be ignored. The Green is finishing up their own Liars & Lovers tour and jumped on the Heatseekers Tour for only two shows. I felt fortunate to have caught one of the only shows on the tour which included The Green and I eagerly await catching them again at the upcoming California Roots festival in Monterey on Memorial Day weekend. 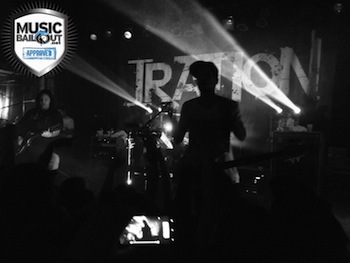 It's unfortunate that Iration won't be there this year. They headlined the festival last year and will likely do so again in the future. When that happens, you can be sure to see me there, staking my claim.